Each year, Missouri schools take steps to prepare for emergencies that might occur while they are in session. Families also need to be prepared for emergencies, and we are asking your help in educating students and their families on steps they can take now to prepare. Ready in 3 can help Missouri school administrators, teachers, students and parents take steps to prepare for emergency situations. Ready in 3 includes many tools and materials available to Missouri schools and families at no charge. Many schools have their own emergency plans. Officials at your child’s school should have current contact information for you and another family member. Make sure they have up-to-date home, work, and cellular telephone numbers. Is there enough water and food stored at the school for all the children? What first-aid supplies are at the school? Are the teachers and administrators prepared to shelter in place? 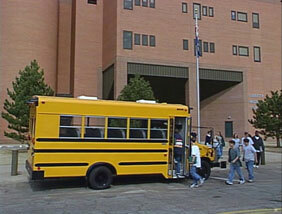 Where will the students be taken if they must evacuate the school? Having a plan for responding to emergencies is important for everyone. We encourage you to use the Family Safety Guide's emergency kit checklist to stock emergency kits for each of your classrooms. Consider distributing the Family Safety Guide (English, Spanish, Bosnian, Romanian, Russian and Braille), Bookmark and the Preparedness Game to your students during the school year when you are conducting tornado and fire drills. We hope teachers will use the video, aimed at motivating students and their parents to prepare in advance of emergency situations along with the Family Safety Guide, lesson plan and teacher’s guide for educating students on how important it is to prepare. Order your Ready in 3 materials here.